When someone refers to the Orania zonae, they’ll be giving a nod to FIU tropical botanist Scott Zona. 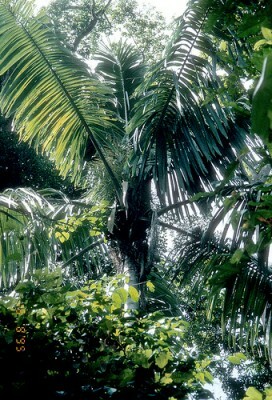 The species of palm was named after the curator for the FIU Wertheim Conservatory and faculty in the Department of Biological Sciences earlier this year. “It’s humbling, I feel terribly honored to be recognized in this way,” Zona said. Orania is a genus, or class, of single-stemmed tree palms. This class belongs to the family of Arecaceae, commonly known as palms. There are a total of 28 Orania species in the world, 25 of which are found in Malesia and the other three are confined to Madagascar. Highly ornamental but often uncultivated, the Orania genus is an isolated and unusual group. In 1995, Zona joined then-master’s student Ary P. Keim, from the University of Reading in the United Kingdom, and his advisor John Dransfield, from Royal Botanic Gardens in Kew, England. As part of Keim’s master’s research, the trio explored and scavenged the remote rainforests in the Bird’s Head Peninsula of New Guinea. Eleven new species were discovered as a result of this research trip. They were described, for the first time, in A monograph of the genus Orania (Arecaceae: Oranieae) earlier this year. Keim recognized Zona’s efforts by naming a species in his honor. A Boynton Beach native, Zona was smitten by diverse South Florida flora at an early age. His initial interest in orchids evolved into a passion for palm trees in high school as he ventured into horticulture and grew his own palms. A botanist and horticulturalist by trade, Zona has traveled to more than 20 countries throughout the Western Pacific, Caribbean, Central America, South America and the continental United States to study tropical plants. More than a researcher and a professor, Zona is passionate about palm trees and flora. Zona has also published more than 100 scientific and popular articles in national and international magazines and journals in more than two decades. Zona is also the co-author of The Encyclopedia of Cultivated Palms, 2nd ed., a definitive account of all 825 species of palms that can be grown for ornamental and economic use. He will be teaching Taxonomy of Tropical Plants in Fall 2012. To learn more from Zona about the Wertheim Conservatory, check out the photo essay below.